This is a guest post by Hilary Wardle. Hilary is a freelance journalist specialising in arts, entertainment and social issues. She runs TV Jam, which takes a humorous look at the world of television, and also Tripadvisaargh: a Tumblr collection of weird and wonderful Tripadvisor reviews. She currently writes for MSN TV, The Guardian, The Independent, Lesbilicious Magazine and a variety of other sites and publications. When I confidently announced to a friend that I’d be marching against the ‘Bedroom Tax’ in Edinburgh on Saturday I was met with a confused stare. This jolted my world view a bit, as one of the things about Twitter is that – by following like-minded people – you can convince yourself that everyone knows about an issue. Even more dangerously, you can convince yourself that everyone feels the same way about it as you do. That was certainly the case where the Bedroom Tax (or under occupation penalty, to give it its formal title) was concerned. The issue of housing benefit claimants being forced to either downsize their property or face swingeing benefit cuts has taken over my Twitter feed in recent weeks, so after I’d reminded myself that not everyone gets their news from social media I was well placed to explain it to my bemused pal, confident that she’d be up in arms too. Basically – no. The coalition are fully aware that most of these so called ‘under occupying’ people can’t move because there simply isn’t nearly enough one bedroom housing stock in the UK. It’s in very short supply, particularly in the North of England. These people who can’t move as their housing association or local authority don’t have any smaller properties available are nevertheless announced to have ‘decided’ not to move, that they are under occupying the property and are therefore ‘scroungers’, which is then used as an excuse to cut their benefits by 14 to 25%. That massive cut was always the goal, but the Tories are hiding it behind language that – yet again- demonises the poor and turns people against benefit claimants. This benefit reduction is a devastating, gigantic cut for people who are already struggling and will force huge numbers of job seekers, single parents, disability living allowance claimants with specially adapted houses and some foster carers deeper into poverty – poverty that in many cases can’t get much worse. Those affected will lose £70 a month on average. They don’t have £70 a month to lose. I can personally tell you that there is nothing cushy about a life on benefits, not least because the electricity prepayment meter invariably runs out when you’re in the middle of doing your homework, it’s freezing because the gas has been cut off (and you don’t have carpets), you’re constantly threatened by landlords, bailiffs and – even worse – you have to wear trainers off of the market that say ‘TRAINERZ’ on them instead of Nike and everyone laughs at you in PE. And that was the luxurious ‘high life’ under New Labour. Nowadays, many single parent families like the one I grew up in can’t even afford shoes, clothes or food, never mind swanky ‘Trainerz’ brand market-trainers. They’re relying on emergency loans, food stamps and charity hand-outs already, and that’s before the government chops another 25% off what I’ll laughably describe as their ‘weekly income’. The ConDem government are fully aware that there’s nowhere for the majority of these people to go. They just want an excuse to implement cruel and punitive benefit cuts while simultaneously turning lower and middle income people against the poor and disabled. Divide and rule, eh guys? 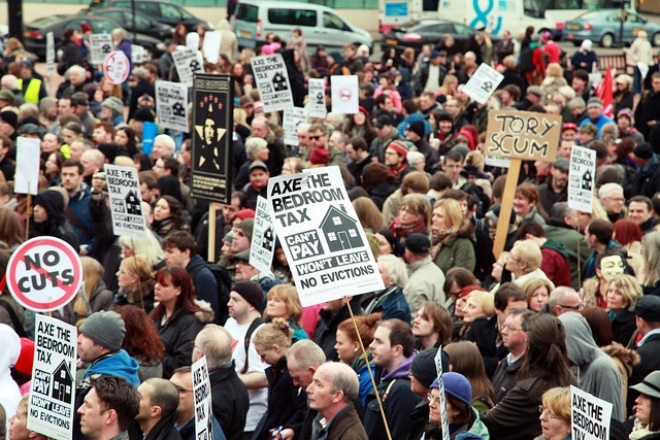 Photo of a large group of anti-bedroom tax protesters in Glasgow by Stuart Crawford, shared under a Creative Commons licence. The visible placards read “Tory scum”, “Axe the bedroom tax. Can’t pay. Won’t leave. No evictions” and “No cuts”. I think that this debate should be more than just recognising that moving is not always possible (for a number of reasons) for the the poor. This ‘tax’ fundamentally undermines the basic human right that people have to a homelife. Most people are given council houses that meet their needs at the time, but as life happens – their children leave home, or marriages break up, or whatever – the number of people living with them changes. In addition, some people are given houses that are ‘too big’ as that is what is available in the council stock. In neither instance is this the ‘choice’ of the council tenant. Moreover, once settled in their homes, most tenants do significant decorating and repairs to make them homely, financially investing in their homes. What this council tax is saying, however, is that your council house is NEVER your home as you cannot remain in it throughout life’s twists and turns. You do not get the privilege of looking at your home and seeing it as somewhere secure where you can place roots. Instead, your council house is only ever temporary accommodation for a particular stage in your life. We regularly see complaints about elderly people who lose their homes as they cannot afford to pay for carers etc (and even the Tories have taken a stand against this), but the poor deserve no such outrage – no such rights to a home – it seems; they should be moved on from their homes when their families change. This is also a fundamental challenge to the concept of council houses, because in suggesting that council houses are not homes, but temporary accommodation, it suggests that living in council houses is aberrant and even anti-social. (These rules after all do not apply to private tenants receiving housing benefits). But council housing was not and should not be understood as a form of benefit in itself, but rather an alternative housing option designed to ensure that everybody has a minimum standard of housing and that everybody has access to a home. It recognises that cheap, private housing often doesn’t exist and if we are going to live in a class-based society that the people on the lower rungs of the social ladder will not be able to access good quality and affordable housing. This ‘tax’ changes the whole discourse around what council housing is, and that is every bit as worrying. I object to the term “bedroom tax”. The system is undergoing changes to try to reduce the welfare bill. Housing benefit should be awarded to meet the housing needs of a person or family. I am in total agreement with the current government. Social housing is to meet the needs of the population who cannot afford their own homes. However, social housing must be allocated purely on the needs of the applicants. One of the reasons for the social housing crisis is the fact that a large percentage of social housing is under-occupied. Whilst I am not suggesting anyone should be uprooted by force, tenants should accept that benefit should only be paid to cover their individual needs and additional benefit to cover full rent when there are unoccupied bedrooms is unfair. This does not happen to private sector tenants. For homeowners, there is little help if you become unemployed and your mortgage becomes unaffordable. There is no benefit in place to keep these people in their homes. Whilst we may go through a very difficult time trying to put right the social housing crisis, I think the under-occupancy cut in housing benefit is necessary. I cannot think of any fairer way to resolve this issue. Tenants have 3 options; to pay the shortfall in housing benefit to meet full rent liability; to downsize so that there is no shortfall; to consider lodgers to meet the additional cost. If we ask under-occupiers to voluntary offer an exchange what success would this bring? I work for a local charity assisting client’s with rent arrears and other debt issues. I find the level of benefits received for tenants with children is more than sufficient to meet this additional cost. A large percentage of my client’s subscribe to Sky TV or equivalent, have mobile phone contracts that include the latest smart phones, have lap-tops, TV’s and games consoles on hire purchase with the average payments being around £16.00 per week. All that is needed in these instances is help prioritising and budgeting. The real victims in the under-occupancy cuts are single, under 25’s and in receipt of Job Seekers Allowance/Employment and Support Allowance with a weekly income of £71.70 only. Rather than complain that the “bedroom tax” is unfair when it is clearly the fairest solution to all, try to come up with a “fairer” alternative to reduce the housing benefit bill and free up under-occupied social housing.